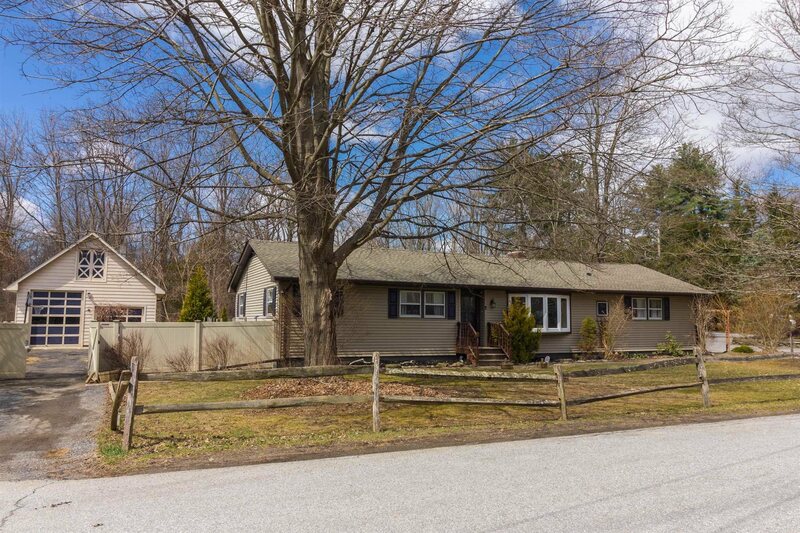 Just a few minutes south of the village of Rhinebeck is this well cared for straight ranch, offering the convenience of one-level living. Welcoming you just beyond the foyer is a large, well-equipped kitchen with beautiful cabinetry, newer granite counter tops, stainless appliances and a new bow window that lets in lots of natural light. Steps away is a formal dining room with hardwood floors, and a large living room with a fireplace (efficient wood stove insert) and plenty of space for family gatherings. Just down the hall is a family room with vaulted ceiling that sets up nicely for your media needs. The master bedroom suite has a gorgeous private bath, newly renovated with ceramic floor, double vanity against a wall of cultured stone and lavish double shower. On the other side of the floor plan are two additional bedrooms with hardwood floors, as well as a striking hall bath with stone floor, elegant vanity and ceramic bath/shower. The full basement has plenty of storage, washer/dryer, heating system approx 8 yrs old and new and on-demand hot water, and new upgraded electric panel with generator hookup. The architectural shingle roof on the house is less than 2 years old and the garage less than 5. A screened porch overlooks the level rear yard, which is enclosed by a solid PVC fence, offering privacy and protection for family and pets. The generous 2-bay detached garage has one extra high overhead door, perfect for taller vehicles, campers and boats. An unfinished bonus room above has new carpet and could be repurposed into a hobby space, music room or yoga/mediation studio. Don&apos;t miss out - call today for a private tour!